The American Federation of State, County and Municipal Employees, Local 3299 went on strike on April 10 to assert that workers have a right to protest without fear of retaliation or coercion, a problem which falls under the blanket of Unfair Labor Practices. 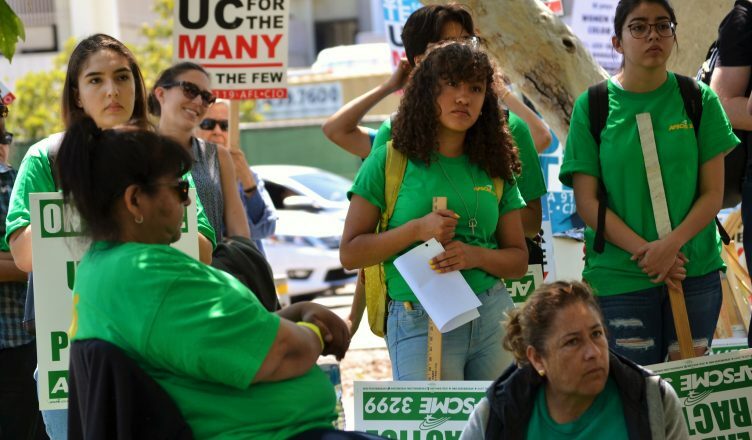 Following the union’s submission of the ULP charge to the Public Employment Relations Board–a quasi-judicial California state administrative agency–AFSCME members on all University of California campuses headed to the picket lines. UC San Diego workers marched in front of Gilman Parking Structure, La Jolla Medical Center, and Hillcrest Medical Center. The ULP charge compiled various incidents in the past six months, many of which were seen in connection with the March 20 of this year and October 2018 strikes. The document claims that the UC system retaliated against workers, threatened them with police citations, and in one instance, physically assaulted protesters. This was seen when UCSD Labor Relations sent out a letter to workers summarizing the contract proposal from negotiations which AFSCME representatives previously rejected. The letter concluded by stating that continued strikes are costing employees money and that they should sign on to the contracts. AFSCME’s ULP charge rebukes the email by stating that the UC system fails to share how they calculated their estimates, noting that UC system omitted useful pieces of information from the calculations. According to the charge as well, a UCSD Medical Center supervisor suggested to union bargaining members that they could “give themselves a raise” if they quit the union. AFSCME considers this to be an unlawful tactic to deter workers from being a part of the union. Throughout the UC system, workers were allegedly provided with misleading communication that misrepresented workers’ rights and union participation. The UC Office of the President maintains their position as driven to reach an agreement with union leaders. They argue that AFSCME is more concerned about having strikes than actually coming to the negotiating table. Elected by union members, AFSCME’s bargaining team represents members’ preferences when discussing with UC negotiators, de Los Angeles said. The competitive proposals made by the UC Office of the President fail to acknowledge and address the union’s major grievances–namely outsourcing and inequality. De Los Angeles further clarified that the protest on April 10 is much more fundamental than about worker’s wages and benefits. Rather, he stressed, it’s about the importance of being able to protest for workers’ rights without fear of repercussions, which is why AFSCME submitted the ULP charge in hopes of tangible litigation. The board will now assign staff members to examine the individual claims made in the ULP charge. PERB will determine the deadline of the investigation and provide that information, when available, to AFSCME and the public.